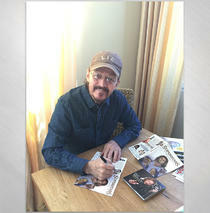 The ONLY OFFICIAL "Jesus Christ Superstar" Film "Making-of" Documentary DVD Produced By Ted Neeley. These very limited copies have been recently signed by Ted and read "Ted Neeley 2016"
Brand New 2015 Documentary "SuperstarS" takes the viewer to the Jesus Christ Superstar movie set in Israel in 1972 and to New York City in 2015 for the historic Reunion of the cast members! 2 features on the DVD, both 52 min each. Region Free DVD (will play anywhere in the world).